I've never used many OS X Dashboard widgets. I'd *much* prefer if they could live on the desktop (without buying an app that hacks that into being). But I do use it to track several different radars, via Safari's Web Clips. Top left: NOAA's NWS Doppler Radar from BOX. 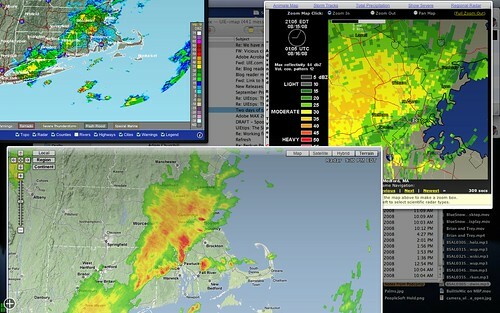 Top Right, Weather Underground's Boston Doppler, zoomed in, and bottom, Weather Underground's newish Wundermap which overlays a nice radar visualization over a Google Map. I have most of it's options switched off.